Ok all you New Mexico fans. THIS is something you definitely want to try! 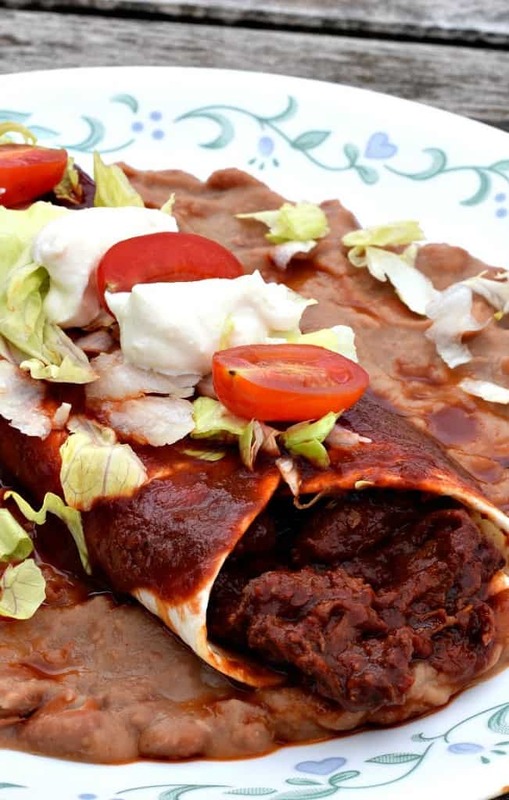 I always thought Butler Soy Curls would make some amazing Carne Adovada Burritos when cooked in my New Mexico Red Chile Sauce. Well not only was i right – they surpassed everything I expected – and more! The Soy Curls have just the right texture to make you think you’re biting into some juicy Carne Adovada – and the Chile just seals the deal. Ok, ok, for those of you not in ‘the know’ about New Mexican food…. 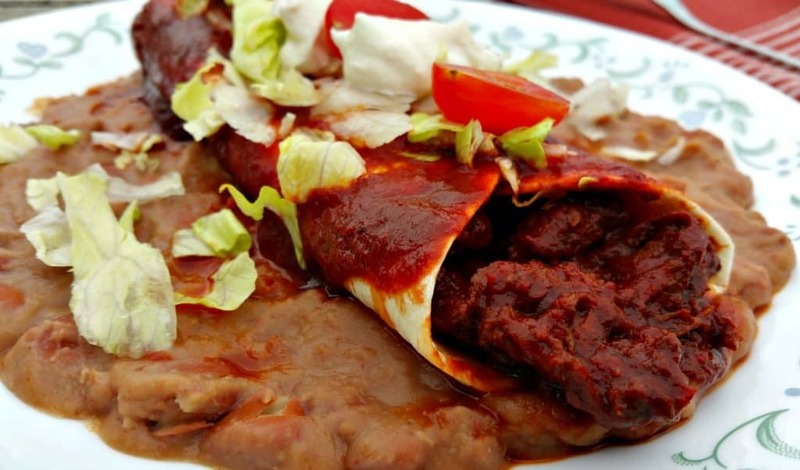 Carne Adovada is a very traditional New Mexican dish consisting of pork strips that have been marinated in Red Chile Sauce. They are usually served with eggs for breakfast, in a stew all by themselves, deep-fried in Chimichangas, or wrapped up in a Burrito like I did here. Butler Soy Curls are whole, shredded, Non-GMO Soybeans that have been dried and packaged. To use them you just soak them in some hot water until they are rehydrated, and then add them to your soups, stir-frys, whatever. I have used them in a Chicken and Dumpling Recipe as well as a Shredded BBQ Beef Recipe and they are wonderful. The texture is just like shredded meat – so for those of you who still have meat-eaters in the house – these are a perfect way of introducing them to a plant-based diet. I buy them at my local Whole Foods, but they are also available online at both the Butler Website as well as Amazon. Here is an affiliate link to Amazon in case you’re curious – but just so you know I will make a few pennies if you use this link. To make this recipe you’ll need a batch of my New Mexican Red Chile Sauce, and a bag of Butler Soy Curls. Simply rehydrate the Soy Curls by dumping the entire package into a large bowl and cover with hot water. Allow to soak for at least 10 minutes before using. I normally add some kind of seasoning to the water, like Soy Sauce or a No-Chik’n Bouillon Cube although this it totally optional. The Red Chile will add enough flavor on its own. Wrap in your favorite tortilla and garnish with shredded lettuce, chopped tomatoes, and maybe a dollop of Vegan Sour Cream. Make it a complete meal by adding Spanish Rice and Refried Beans. 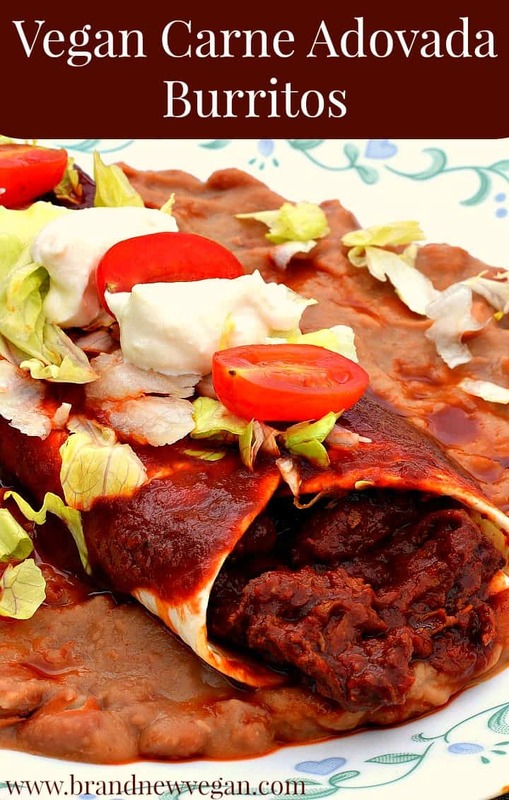 Who would have though that Butler Soy Curls and New Mexican Red Chile Sauce would make the perfect Vegan Carne Adovada? Ok all you Chile fans this is a must try! Add Soy Curls to a large bowl and cover with hot water to soak. 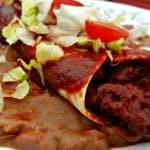 Prepare New Mexico Red Chile Sauce according to recipe. After blending Red Chile, pour into large pot and begin to simmer.